FBC Industries, Inc. specializes in producing liquid additives and preservatives for quality-minded food and beverage manufacturers. Liquid products provide our customers with value-added benefits of improved quality, consistency, ease of use, reduced handling costs and faster batch times. FBC Industries, Inc. continually invests in research and development of new processing solutions for the food and beverage industries including customized blends to meet individual specifications. Robert W. Bloom founded FBC Industries, Inc. after many successful years in the chemical distribution business because he understood the needs of chemical consumers. His vision was to provide quality additives and preservatives to the food and beverage industry manufactured in a liquid form for greater efficiencies and consistency during the production process. He successfully achieved this task by assembling an immensely talented group of professionals who share his high level of commitment and quest for continued product development. Robert Bloom continues to be widely respected in the chemical industry participating as an active member of the Chicago Drug and Chemical Association and the Institute of Food Technologists. He has also served as past President of Region 4 for the National Association of Chemical Distributors as well as a past member of the Board of National Directors. 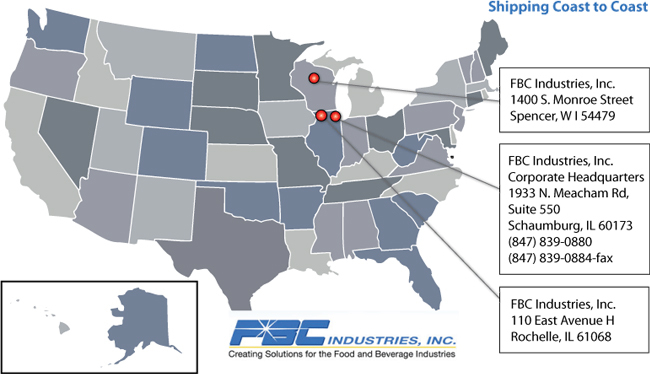 Today FBC Industries, Inc. serves many of America’s top Food and Beverage manufacturers and is made up of a talented and diverse group of professionals dedicated to finding the right solutions for our clients in accordance with Robert’s original vision. FBC Industries, Inc. produces liquid preservatives and additives for quality-minded food and beverage manufacturers. Liquid is the clear choice to providing our customers with quality, consistency and efficiency.